The Las Vegas Strip is a stretch of South Las Vegas Boulevard, known for its concentration of resort hotels and casinos. The Strip is approximately 4.2 miles (6.8 km) in length, most of the Strip has been designated an All-American Road, and is considered a scenic route at night. 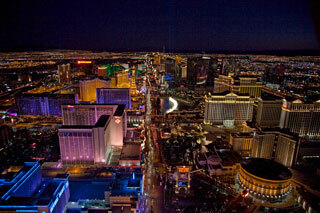 Many of the largest hotel, casino, and resort properties in the world are located on the Las Vegas Strip. This article uses material from the Wikipedia article "Las Vegas Strip at Night", which is released under the Creative Commons Attribution-Share-Alike 3.0 License.